The view from the Geneva National clubhouse shows why The Legends Tour couldn’t finish Round 1. Saturday was not a good day for all the top women golfers who are visiting for two big tournaments. 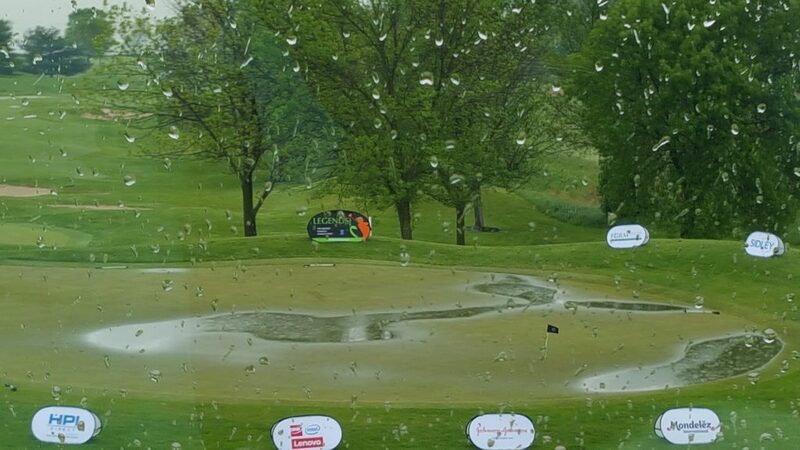 Both the NCAA Division I Women’s Championship at Rich Harvest Farms in Sugar Grove and the $300,000 Red Nose Walgreen’s Charity Classic, for players on the LPGA Legends Tour, were rained out. No balls were struck at Rich Harvest. The field of 24 teams and 12 individuals were scheduled to begin second-round play at 7:30 a.m. The tee times were first pushed back and then the round was called off as the rains continued to fall. “With the severe weather threats that we monitored throughout Saturday morning, our committee came to the determination that, given the conditions, cancelling Saturday’s round was needed to maintain the overall student-athlete experience and the integrity of the championships,’’ said Jim Fee, chairman of the NCAA Division I women’s golf committee. The 8:30 a.m. starting time for the scheduled first round in the Legends event on the Gary Player Course at Geneva National Resort in Lake Geneva, Wis., was pushed back 30 minutes and play did begin there. The course became unplayable before the last threesomes could tee off and – after a lengthy delay – the round was cancelled at 2 p.m. Both tournaments plan to resume play on Sunday. The Legends, playing their first-ever tournament close to the Chicago area, had planned a 36-hole competition to climax four days of activity. A Wednesday pro-am and a qualifying tournament on Thursday went off as scheduled before the bad weather set in. The tournament will now be reduced to 18 holes. Despite cold, rainy weather, the NCAA Division I Women’s Championship got in one round on Friday with Northwestern grabbing the team lead, two strokes ahead of second place Kent State. They’ll be paired again in Sunday’s second round. The tourney originally called for 36 holes before the field would be cut from 24 to 15 teams, then two more rounds before the teams were reduced to eight for the match play climax to determine the champion. Now all 24 teams will continue with stroke play rounds on Sunday and Monday. Then the top eight teams will advance to match play, as per the original schedule. The team title will be decided on Wednesday after two days of match play eliminations. Golf Channel coverage will begin on Monday with pre-game coverage starting at 3 p.m. followed by live coverage at 4 p.m. That coverage will continue through the match play portion of the tournament.